Did you know that oatmeal has been cultivated for over 2000 years and was used for medicinal purposes before consumed as food? Any food that has stood that test of time can’t be too shabby for you! Oatmeal retains its bran and germ resulting in a higher level of fiber and nutrients. Oatmeal is a great source of manganese, molybdenum, and phosphorus as well as a good source of copper, biotin, vitamin B1, magnesium, dietary fiber, chromium, zinc, and protein. Including oatmeal in your diet can lower your cholesterol thereby helping to reduce the risk of cardiovascular disease. 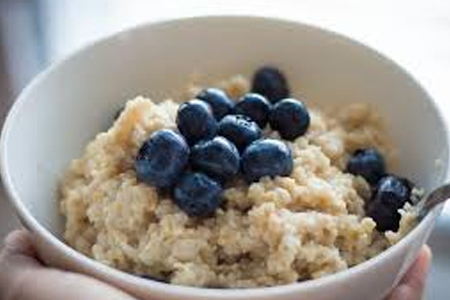 Oatmeal also helps to stabilize blood sugar which could be beneficial for those with diabetes. You can eat this recipe two ways. When it’s cold out, a hot bowl of piping oatmeal is just what I need to get my day started so after mixing the ingredients overnight, I cook it on the stove in the morning. And when the weather warms up, I prefer making this recipe by mixing the ingredients overnight and eating it raw and cold the next morning. Either way, this vegan recipe is super quick to prep the night before, leaving you with a balanced breakfast in the morning in minutes.